So, you've probably seen my HTC Legend Review I posted a few days back. Unlike my other reviews, I wasn't able to post some screenshots because I was having a hard time installing USB drivers for the HTC Legend. Well, I downloaded the latest USB drivers from the Android website through Android SDK (you need this software to take screenshots on your HTC Legend). Even though it was the latest drivers, my Windows XP still can't recognize the HTC Legend so I did some searching and came upon this site. under the [Google.NTx86]. Here's a screenshot of where I put it. After that, under Device Manager, update the drivers for your HTC Legend and it should detect and install the drivers automatically. You rock! I really needed this :). I am trying to get the usb drivers for htc legend loaded onto my win xp machine. I followed these instructions and it's still not working. It is a vodafone HTC Legend. Can anybody suggest anything? @Jeff. Try downloading HTC Sync from HTC. I got the same issue as @Jeff's. I used android r3 driver and downloaded HTC Sync and installed/uninstalled it so many it also still didn't work. I found the android phone's hardware id is "VID_0BB4&PID_0FF9" then pasted it to the .inf file, updated the driver again. It works. 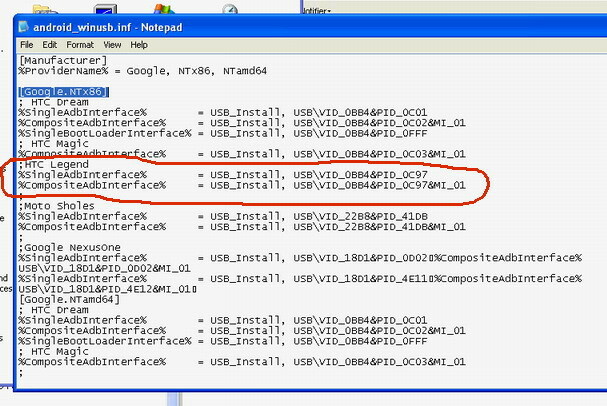 My PC can recognize the android phone, but the Android ADB Interface got "Code 10" in device manager. Was searching for this all day..
10x this helped me a lot! 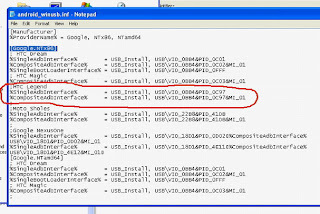 "In order for the HTC Legend to be recognized by the Android SDK, open the android_winusb.inf file under the usb_driver folder and add "
where can i find winusb.inf file?? ?